Jaguar fans will be licking their lips at the prospect of two new cracking models hitting our streets. 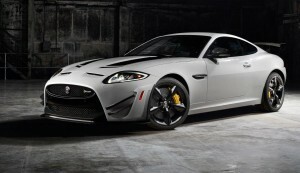 That’s because the prestige carmaker has unveiled the impressive Jaguar XKR-S GT and Jaguar XJR. The Jaguar XKR-S GT is the ultimate road-going, track-ready XK coupe which has been developed by Jaguar’s ETO division and production is limited to just 30 cars. The Jaguar XKR-S GT is the rarest model in Jaguar’s 25-year history of R performance cars. Powered by Jaguar’s supercharged 5.0 litre V8 engine, producing 550PS and 680Nm, the Jaguar XKR-S GT takes just 3.9 seconds to reach 0-62mph. Its top speed is electronically limited to 186mph. With power like that it comes as no surprise that the Jaguar XKR-S GT has carbon ceramic brake system fitted as standard – a first for a production Jaguar. The Jaguar XKR-S GT also features bespoke aerodynamic aids for maximum downforce and the bespoke adaptive dampers are eight-way adjustable with race-derived twin spring system. The car will have six-speed automatic transmission with paddle shifters and active electronic differential. Meanwhile, the flagship Jaguar XJR brings supercar performance to the luxurious XJ range with a high-performance supercharged 5.0 V8 which produces 550PS and 680Nm of peak torque. There’s an eight-speed automatic transmission with steering-wheel mounted shift paddles which help the Jaguar XJR reach 0-62mph in 4.4 seconds and it has an electronically restricted top speed of 174mph. The Jaguar XJR has aerodynamic enhancements plus new 20-inch wheels and there’s an electronic Active Differential and DSC systems recalibrated for what Jaguar terms as ‘spirited driving’. 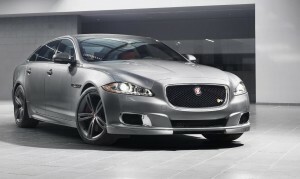 Inside there are exclusive Jaguar XJR cabin materials and ‘R’ embossed leather seat facings. Available to order now, the Jaguar XJR is priced from £92,335 on-the-road while the Jaguar XKR-S GT will cost around £130,000 though, bizarrely, all of the production run is heading to North America – British buyers will have to wait for a right hand production version to be announced. This entry was posted in Car Updates & Releases, Luxury Cars, New Cars, Sports Car and tagged Active Differential, car, coupe, DSC, Jaguar, jaguar xj, Jaguar XJR, LS, North America British, price, seat, speed, steering wheel, XJ, XK by Steve Lumley. Bookmark the permalink.